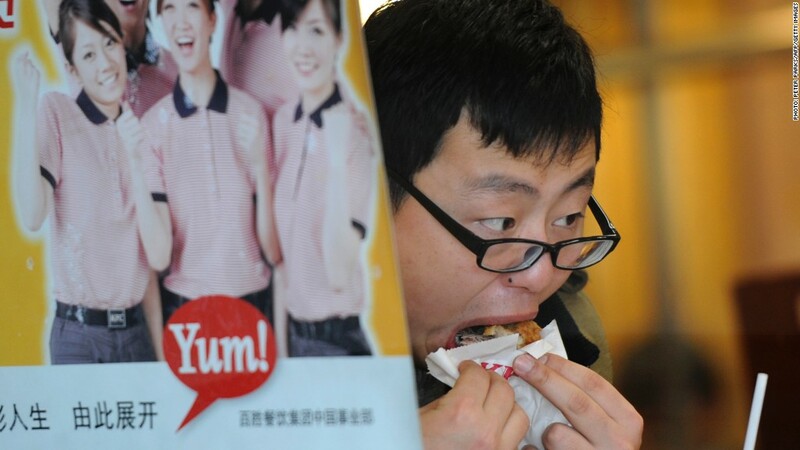 Yum Brands earnings have been hit by food safety concerns in China. The parent company of KFC, Taco Bell and Pizza Hut had another rough quarter in China. Yum Brands said Thursday that net income fell to $281 million in the second quarter, a 15% decline from the same period last year. Same store sales in China were down 20%, the company said. With some troubles expected, the report topped analyst expectations, boosting Yum (YUM) shares in after-hours trading. The company is still grappling with the fallout from a food safety scandal and fears over a new strain of bird flu in China. Yum has placed big bets on future growth in the world's second largest economy; it operates more than 4,200 KFC restaurants in China, as well as about 800 Pizza Huts. "KFC sales and profits in China were significantly impacted by intense media surrounding Avian flu, as well as the residual effect of the December poultry supply incident," CEO David Novak said in a statement. And there are signs that consumers in China are starting to return to Yum restaurants. "The good news is that China sales are recovering as expected," Novak said. "We expect a strong bounce-back year in 2014."